When Raul Labrador prefaces his opinion on the continuing immigration crisis at the border with “it may sound harsh,” we know that what is coming is so. When on CBS’s Face the Nation, Senator Lindsay Graham said “We have to send them back, because if you don’t you’re going to incentivize people throughout that part of the world to keep sending their children here,” it fails to take into account the strong incentives that already exist in Honduras, Guatemala, and El Salvador due to violence initiated by drug cartels fighting over who gets to control large shipments of drugs bound for the United States. It fails to understand that young boys are being trafficked for profit by gangs, and it fails to see that young girls face dangers as they mature from being violated by these same gang members, and drug cartel operatives. This is to say nothing of the generic violence ongoing and uncontrolled in these places. The news media has failed us even more by framing the immigration crisis as political posturing for partisan gain, instead of focusing on the human element. 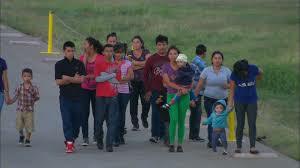 Is it most important to find out if Obama created this rush to our borders? When little children need water, food, and shelter from abuse, is the answer to blame Republicans for not passing immigration reform or to consider humanely treating them? Should 52,000 dogs come across the border en masse without a home, lacking food and water, and needing medical care, animal shelters and humane societies across the nation would rightly spring into action. What Obama did or thought, or blaming Republicans for the mess would be pure folly and anyone would see it. Why is it then so hard to afford human beings who come the same way the humane attitude we reserve for the canine community? What the present crisis at the border is are desperate people seeking protection from violence and abuse where they have lived, and some hope for a future for their children free from those things. Elemental human compassion has gone missing from the so called “debate” on immigration policy. It’s not how fast we can deport people at the border that is the core question here. What it is has everything to do with how we treat such a vulnerable group of persons who’ve crossed our borders illegally, while they are in our care, and our responsibility. Central to the response we ought to be focused on is both empathy and compassion. The two are so closely linked that it is impossible to exercise compassion without the presence of the former. Empathy is our ability to place ourselves in the position of the very children and mothers who have come, and who face such an uncertain and dangerous future that they would have risked so much just to get to us. Our response to this empathic concern is not to turn them away, but to exercise a newly informed compassion, just as we might care for a sick bird in spring. Are not little human ones just as valuable and deserving? The moral and theological guidance to Christians is best stated by Jesus the Christ in what he says of the place of children in relation to God. Jesus brought forward a little child who was physically with them. The scriptural WWJD moment is when Jesus tells believers, “Whoever becomes humble like this child is the greatest in the Kingdom of heaven, who even welcomes this child in my name welcomes me.” By the most direct inference whoever does not refuses him. Clearer still in this command is the next passage, “if any of you put a stumbling block before one of these little ones, who believe in me, it would be better for you if a great millstone were fastened around your neck, and you were drowned in the depth of the sea.” Ouch! Is this clear enough? The Islamic faith makes concern for others very central. Allah, the one God, is in daily prayer said to be uppermost both compassionate and merciful. The clear injunction could not be clearer for Muslims, meaning one who submits to the will of Allah. They must act in accord with this one supreme and only God. Buddha taught compassion and understanding as the way to nirvana, that highest state of being, and the very definition of wisdom. Hindus making their way through what may be a multiple of lifetimes know full well they will not advance in that cycle of birth, death, and rebirth to achieve that highest level of being, or Moksha, if they invite bad karma by their misdeeds. Even a minority sect within Hinduism, the Janists, amid their self- denial, often employ brooms to wipe aside the smallest insect lest they step upon them, to respect life and the moral path they are on. Agnostics and Atheists in relation to faith traditions are most often humanists, valuing both the sanctity of individuals and communities. They yet have strong ethical and moral belief systems that comport very closely with all the major faith traditions. It would seem that those who most want some sort of legal retribution on these children, coming to us with their mothers, but most often alone, frightened, and in need, hold these positions from fear, anger, and ignorance. The United Nations has strong positions on how refugees from violence and oppression who may seek asylum are to be treated. The broad base of humanity must condemn this xenophobic response on the part of many Americans, who fearful of strangers, and seeing only the perception of a grave threat, obstruct the needed humanitarian response. Let’s hope the Ted Cruz’s, Raul Labradors, and Lindsay Grahams of this world find the elemental empathy and compassion that has gone missing in their rhetoric and policy. If not, a lot of little children who have no skin in the game of partisan politics in the United States are going to be critically harmed. When fear, hate, and ignorance brought forward for mere partisan political gain trumps the obvious moral and compassionate human response, our nation and its people are in danger of losing our way, and denying what is so central to whom we claim to be. Richard Handhardt, MS, MBA, BCSLC, “The Birth of Compassion: The Path to Finding Love,” Nature’s Pathways, July 2014, 40. Interview, Marc Ian Barasch, “Desmond Tutu on Compassion,” Psychology Today, 1 March 2005,http://www.psychologytoday.com/articles/200504/desmond-tutu-compassion. Matthew 18:4-6, New Revised Standard Version, NRSV. Leviticus 19:33-4, NRSV. Here “foreigner” can be easily substituted for alien. This entry was posted in Essays, The Faith Community and tagged Border Crisis, Compassion, empahty, Faith, faith communities, Illegals, immigration, Immigration Debate, Immigration Reform, Lindsay Graham, little children and their welfare, Raul Labrador, Raul Labradors, Richard Hanhardt, senator lindsay graham, Ted Cruz, Undocumented. Bookmark the permalink.